It's getting harder to locate, but Campagnolo chain is worth the added effort to find because it is a superior product. I've tried all the other 10 spd. chains on my Campy drivetrain, and none do the job as well as the Campy chain. Great chain with Campy Record 10 shifting is perfect and very sharp! I replaced the chain on my Eddy Merckx 3XM with the Campy ultra narrow and realized I should have done this a long time ago. Although my old chain was only at 50% of its life, this new chain is so much smoother. Well worth the upgrade. This is the upgraded, slightly narrower version of the 10-speed Campagnolo Record chain that was introduced not too long before Campy changed their top groups to 11-speed. 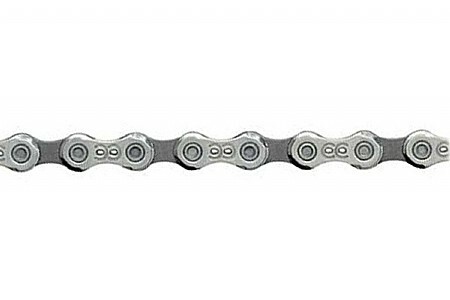 If you are still using 10-Speed Campy drivetrain, you can't go wrong with this chain. The previous Record chain, which was about 0.2mm wider, didn't last nearly as long. I average 100 miles per week, and I used to go through a couple of the older Record 10-speed chains in a year. This chain still checks good on a Park chain-wear gauge after more than three and a half years of use. I bought a spare from this web site but haven't had to use it. It's expensive for a chain, but I still give it four stars for value based on its longevity. i replaced my worn out record chain that lasted apx. 15,000 mi. My new record chain runs as smooth as silk and would not use any other brand with my campagnolo group.